The St. Thomas Tommies picked up their first win of the preseason this afternoon with a hard fought 4 - 3 victory over the NCAA Sacred Heart Pioneers in Milford, Connecticut. Justin Collier got the impressive W with a 29 save performance. The Tommies didn't wait long to get on the board, as Steve Sanza (Bonneau) scored 14 seconds into the contest. Four minutes later at 4:14 Alexander Labonte (Bernier, Levesque) would score on the powerplay to increase the lead. Sacred Heart would respond at 8:29 when Ben Lake would score and tied the game on the powerplay at 13:06 on a Jacob Brightbill goal. Shots were 13 - 6 for the Pioneers in the period. The only goal of the second period was scored at 15:46 by the Pioneers' Beau Walker to give Sacred Heart a 3 to 2 lead heading to the third. Shots were even at 10 apiece. Jonathan Bonneau (Sanza, Cameron) would tie the game at 6:39 for STU and John MacDonald, unassisted, scored the eventual winner with under five minutes to play at 15:30. MacDonald would then get called for interference at 17:50, the Pioneers would pull their goalie, and Steve Sanza would get a tripping call with 23 seconds left in the game to give SHU a 3 man advantage for 13 seconds. The Tommies and Justin Collier stood tall to preserve the win and a happy bus ride back to New Brunswick. 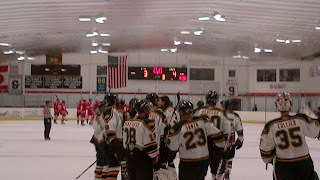 St. Thomas and Sacred Heart were both 1 for 4 on the PP and the final shots were 32 to 25 for the Pioneers. The Tommies will come back to Fredericton and prepare for their regular season opener versus the Squirrels on Friday night at the Aitken Centre.